This is turning out and looking very good Neverness. I really like the overall layout of the piece. Thank you Marcus, it's much appreciated! I hope to get the roof, handles and the banner brace done tomorrow, or at least by next week (I'll be in Nascar hell over the weekend). I'm very pleased with how well this 20 year old foam paints up and, for the most part, does look like quite a bit like stone! The composition is a result of where Death Castle's creater (Doc Trevor) chose to put the door. If I was starting from scratch I never would've put the door off center like that, but as a result, placing the tower in the opposite corner allowed for a bigger tower/keep, and really opens up the courtyard. It'll be really handy for play too! Great castle! It looks old and poor and reminds about anemies buried under it walls and prisoners kept there. I like the way you think comrade! Welcome to the forums! Yes, lots of tortured weeping souls are trapped under it's venerable foundations. I was tempted, and still might do this, to show a break in one of the walls of the base that would reveal a massive fissure of skulls, but it also felt like it might be an unnecessary detail. I mean, the armies that have died, and will die, here are what earned this castle it's name! Did some more work on the castle tower today. Here is a birds eye view of the top of the tower with the roof stones complete. After some experimenting I opted not to put a handle or hinges of any kind on the roof hatch so as not to unbalance any models that may be positioned on the roof. So this part is essentially done. 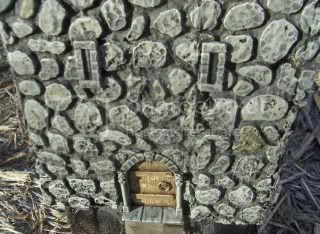 Though it may be hard to see in some of these pics, I did randomly highlight a few stone by giving them a mix of a watered down brown / flesh ink wash.
After finishing that, I put the handles on the doors! They came out OK. I painted these metal, and they stand out good I think. I painted the housing for the banner pole a rusty metal color to convey a bit of age to the tower (as if it didn’t look war-torn and ravaged already!). I also added some rust color to the stone beneath to show the rocks being stained by the slow decay of the banner mount. And finally here is a profile shot taken outside in natural lighting. Thanks steveb! The final step for the Castle tower is to add the balcony/deck and I'm not sure how well the technique I used on the doors will hold up to the same scrutiny. So, where do you (or anyone else) recommend I find some 'Kilz' here in the states? I'm surpised I never heard of this stuff before, I used to work at an arts&crafts store! Time to wake this thread back up! It's been sleeping for well over 8 years now, somewhat peacefully. I have received a few messages over time asking me what the status of this project is. Well, since the last update there has been zero progress, thus, nothing to update. 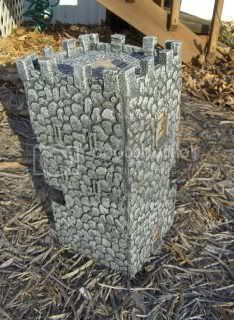 And 2) it has rekindled my desire to finally finish constructing Death Castle! I am very excited to do this actually and shall be posting updates and links here. 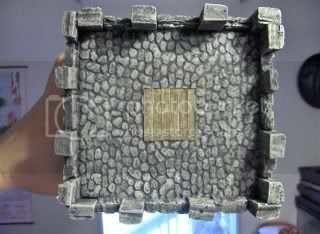 3) it's got me and a local gamer talking about playing 8th Edition WFB again and specifically playing on Death Castle! So exciting times ahead indeed. I hope you all enjoy. I look forward to seeing your progress!! Scenary and cat it's a good pair! Funny and beauty! Finally, after being stalled out on this thing, I have an update. Last winter (2018) I set about painting the stone work on the walls of Death Castle. it was coming along decently. I got most of it finished over the course of about three Sundays. It started out with an Appel Barrel Graphite base coat over the entire thing. Thankfully Walmart sells that stuff in really big bottles so I have more than enough for this task and just about anything else that I use that color for. I slightly mismatched the highlight color with the tower, but I should be able to correct that decently with some touch-ups at some point. Overall, I like how it turned out. However it makes the upper quarter, the solid styrofoam sections, really stand out in an awkward way. And I was stumped on what to do about it. I brainstormed and discussed it with a few friends, but the answers I came up with didn't appeal to me. After many months of being stalled out on this thing, I came up with two workable solutions. Solution 1: Sheet styrene brick sections. Cut them to the pattern needed and glue them on. 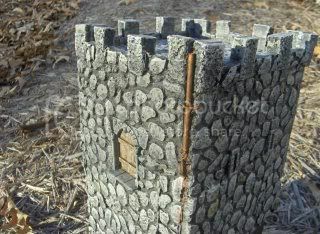 It worked out great on the roof top for this tower and I have made plans in the past to make other things using that stuff. I decided that this would be, due to the crude nature of this thing, expensive, time consuming, frustrating and likely to have crappy results. Solution 2: Take a soldering iron to it and burn out some grooves. At first, I loved the idea. Then I thought about it and realized just how unforgiving any mistakes could be. One wrong move and I could really mess thing up -badly! Hopefully we'll have another update this calendar year! I recall this, and good to know it is still in action.